The SX5 Group of Companies are based in Western Australia and provide a vast range of services to the resource industries throughout the Pilbara. The SX5 Group is 51% Aboriginal owned and has AS/NZS ISO 9001, AS/NZS 4801 and AS/NZS ISO 14001 Certification. With a corporate office in Perth and the Pilbara office; yard and workshop situated in Karratha, the Group is well situated to provide exemplary service to the Pilbara region as well as service their clients throughout the state. The team at Brandicoot enjoyed working with the SX5 Group to make sure their website not only has a fresh new look, but is also running the latest technology and functionality available. At Brandicoot we have perfected our redesign process to ensure the new design and framework are rolled out with minimal downtime and without effecting website rankings on Google. and a simple, easy to find contact page including a Customised Contact Form that means getting in touch with the SX5 Group has never been easier! 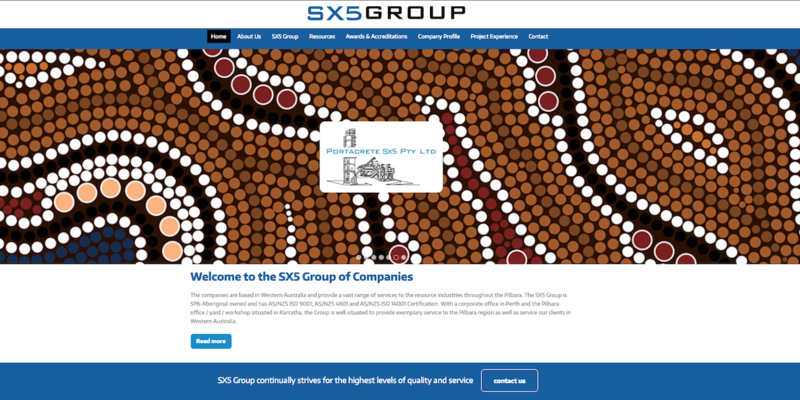 Visit the new SX5 Group website today!